Our family has a love of dictionaries. A couple of years ago, while one of us was writing a paper on theology, we uncovered – just in our home – over 300 dictionaries. Most of these were for English, but there were also philosophy dictionaries, theological dictionaries, psychological dictionaries, historical and geographical dictionaries, biographical dictionaries, and foreign language dictionaries for Japanese, Chinese, Greek, Latin, French, German – there were a lot of dictionaries. 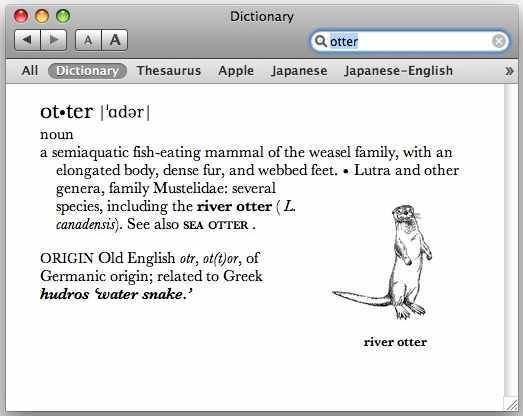 But by far our most used dictionary is the one that comes with Mac OS X. No, not the spell checker, which is pretty cool (and shared by TextEdit, Safari, Mail, and a number of other programs). We mean: a formal dictionary. Little heralded, Dictionary is in the Applications folder, and has been there since the introduction of Mac OS X 10.4. 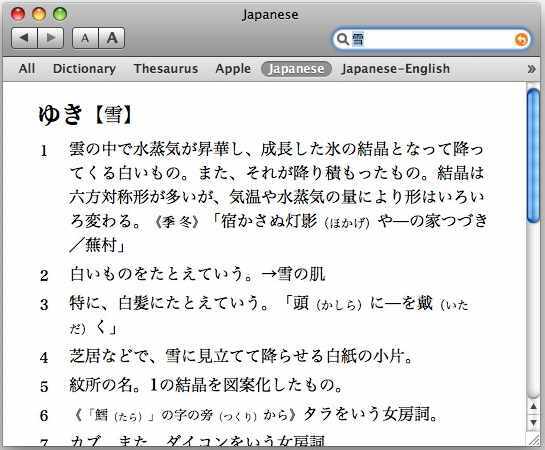 In Mac OS X 10.4, Dictionary offered two references, The New Oxford American Dictionary (2nd ed. ), and The Oxford American Writer’s Thesaurus. Preferences allows you to turn one or the other of them off, but why would you do that? The interface is simplicity itself: start typing, and Dictionary will start listing all the words that start with the letters you’ve typed so far. You can either type an entire word and see the definition (and synonyms), or you can type a few letters and pick the word out of the choices listed. As long as your spelling isn’t too bad, Dictionary will list words that are close to what you typed in, asking, “Did you mean?” and listing the choices. Some definitions in Dictionary include black and white line drawings of the subject. In most Apple applications, and in properly constructed third-party applications, you can drag a word into Dictionary’s search box to look it up. Some definitions even come with black and white illustrations. 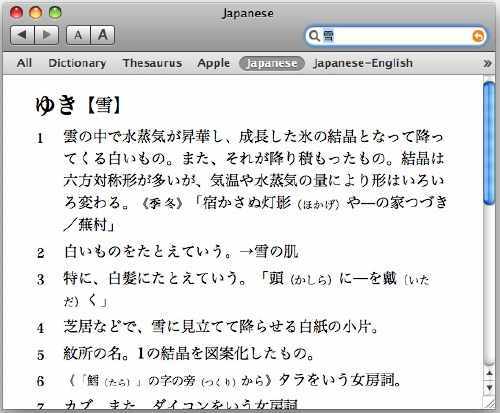 With Mac OS X 10.5, Dictionary expanded into a reference bookshelf. The New Oxford American Dictionary (2nd ed. ), is back, along with T he Oxford American Writer’s Thesaurus. 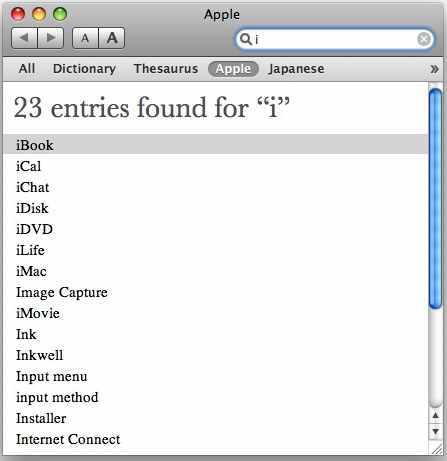 A new entry is an Apple d ictionary, which will define Apple-specific computer terminology such as alias, Aqua, Bonjour, combo drive, desktop, and most of the iWords (iBook, iCal, iChat, iDisk, iDVD, iLife, iMac, iMovie, iPhone, iPhoto, iPod, iSight, iSync, iTunes, iWeb, iWork, but not iCIO), but leaves more general terms, such as Ethernet, network, and Wi-Fi, to T he New Oxford American Dictionary. The Apple dictionary includes an extensive collection of Apple-specific terms and their definitions. Also new are a Japanese dictionary, a Japanese-English dictionary, and a Japanese synonyms dictionary, all from Shogakukan, Inc. Not surprisingly, these require some knowledge of Japanese, since they assume the user can read Japanese. 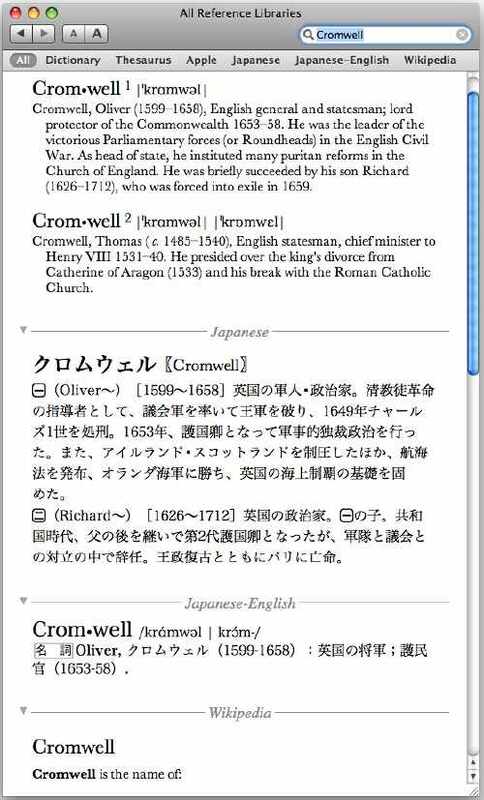 Dictionary’s Japanese dictionary is very cool, but does require knowledge of Japanese. Dictionary now includes Wikipedia. Obviously, Wikipedia itself is not part of Mac OS X 10.5, but if you have an active Internet connection, you can type items into Dictionary’s search box and get results from Wikipedia. Even under the best of conditions, this tends to be a bit slow – but it is both quite cool and occasionally invaluable. Dictionary’s Preferences allows you to turn on those reference items you want available and turn off the others. You can also do other customizations such as, in this case, selecting which one of three pronunciation protocols you wish displayed. You configure Dictionary by going to Preferences and selecting those references you want to appear. 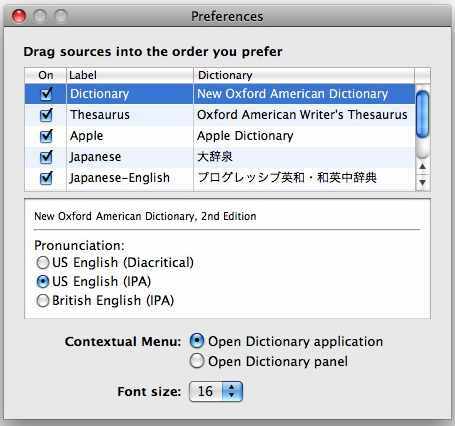 You can turn off everything except the Oxford d ictionary and t hesaurus, or add the Apple dictionary, or any combination of the reference tools. When using Dictionary, if you select All from the menu, whatever you type will be returned from all references you’ve activated. If you select All references and type in Cromwell, you’ll get a couple of definitions from The New Oxford American D ictionary, a couple from the Japanese dictionaries, and multiple entries from Wikipedia. And if that isn’t enough: if you right-click on a word in Safari, you will be offered a list of things you can do, including look it up in Dictionary. This capability, along with Safari’s built-in spell checker, does make you wonder how so many Mac bloggers can be such bad spellers . 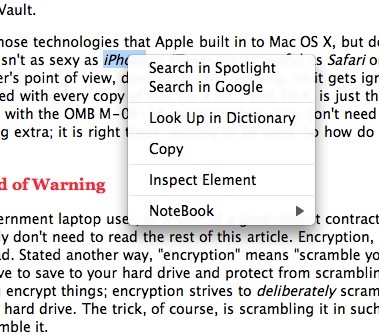 Right-clicking on a word in Safari offers you several choices, including looking up the selected word in Dictionary. Finally, Dictionary results can be selected, copied, and pasted into other applications. This comes in handy when you are arguing with someone on the proper pronunciation of “dromedary,” or the linguistic origins of “gnome,” or when Paracelsus lived (1493-1541, as it happens). As an aid to erudition, Dictionary is invaluable, and easier to carry on an Apple laptop than the equivalent paper volumes.